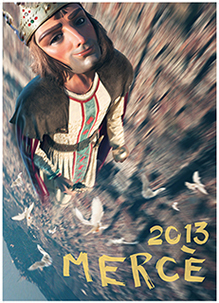 The most famous and large festival in Barcelona, ​​La Mercè, this year are from 20 to 24 September. Here‘s the link to the web. According to legend, on the night of the 24th of September, 1218, the Virgin appeared simultaneously to the King Jaime I, to Saint Pedro Nolasco and to Saint Ramón de Penyafort. Centuries later, in 1687, Barcelona suffered from a locust plague and prayed to the Virgin Mercè for help. Once the plague finished, the city Council named her the patron saint of Barcelona. “La Mercè” started to become famous on 1902 when, under the auspices of Francesc Cambó, a street party was celebrated which became a model for all the parties in Catalonia. 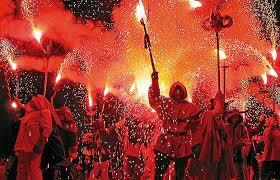 Afterwards, the Mercè celebration had lots of ups and downs after the Civil War and during the years of Francoism. 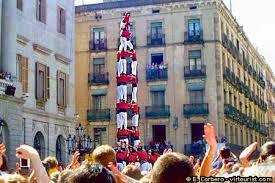 The most traditional activities in “La Mercè” are based on popular culture from Catalonia such as “sardanas”, “castells” and “correfocs“. The most special celebration in Barcelona is street bands, which have been part of La Mercè festivities since the beginning. Today, as before, the street bands organization includes popular culture groups that work with street artists. Plus the traditional part during “La Mercé” are concerts all over the city. It could be a little stress walk in the streets of the center because it is crowded. Anyway always it is nice and fun. If you are here during the Mercè we recommend you join in the party!